Does your little girl love big dots? 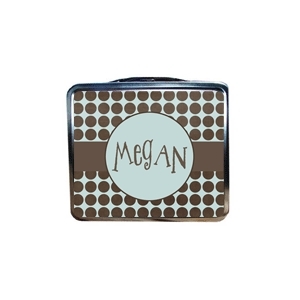 This lunchbox has big brown dots on a pale blue background with your name in a large circle in the center. Our lunch boxes are made of .30 millimeter tin (lead free) and covered with printed, laminated high-tack adhesive on front and back. The inside top of the lunchbox has a chalkboard for writing messages to your little one!